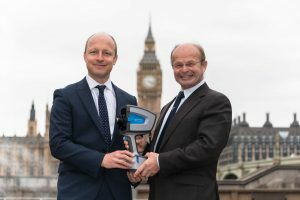 ONE of Woking’s largest employers, Harvey Water Softeners, has donated a new spectrometer device worth £40,000 to a pioneering research study which could revolutionise our understanding of childhood eczema. The handheld Fourier transform infrared (FTIR) spectrometer was gifted to the Unit for Population-Based Dermatology Research at St John’s Institute of Dermatology, Guy’s and St Thomas’ NHS Foundation Trust in London, led by Dr Carsten Flohr, Consultant Dermatologist and senior National Institute for Health Research (NIHR) Fellow. It will be used as part of a clinical trial to investigate the effect of hard water and skin care practices on the skin barrier of newborn babies, looking at how this links in with the development of eczema which affects an estimated 20 per cent of children and seven per cent of adults in the UK.